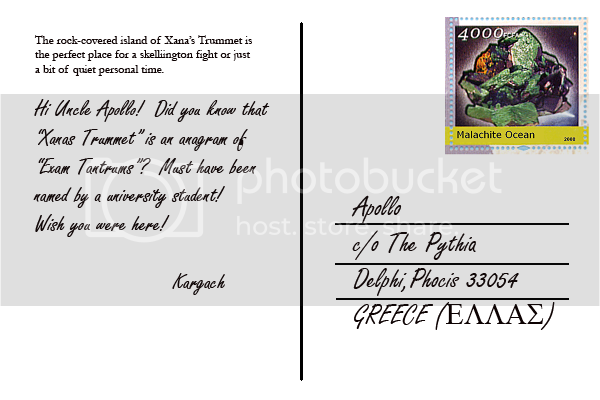 Send me a postcard from somewhere on Malachite! 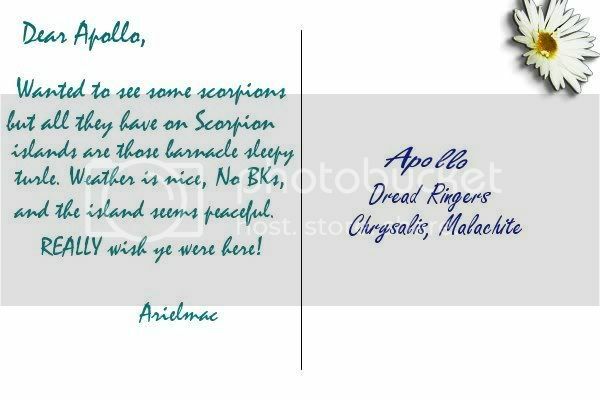 You should provide two images - the two sides of your postcard. 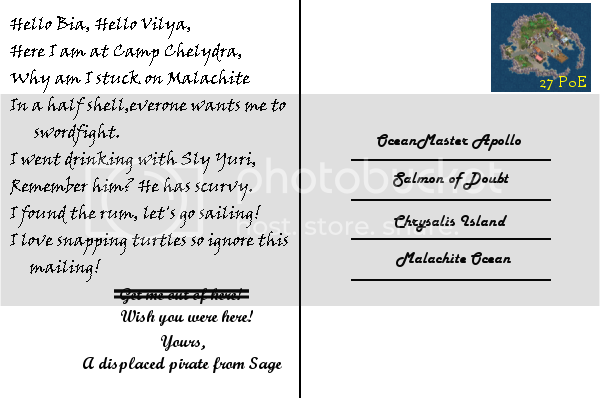 The front of the postcard should have a screenshot picture (or a montage of pictures, if you prefer) of somewhere on Malachite, and you can add a simple caption to it if you wish. 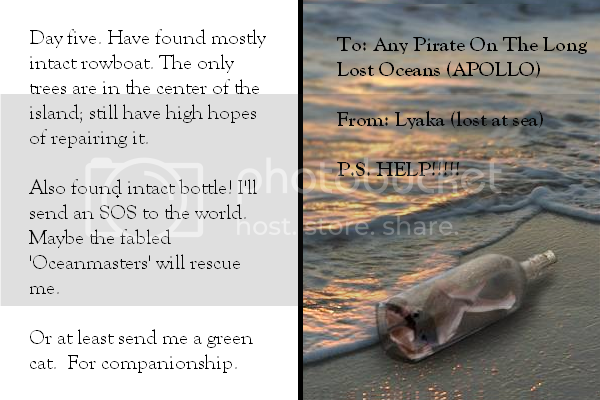 The second image should show the back of the postcard, and your postcard message. This should be a sensible length to fit (and be legible!) 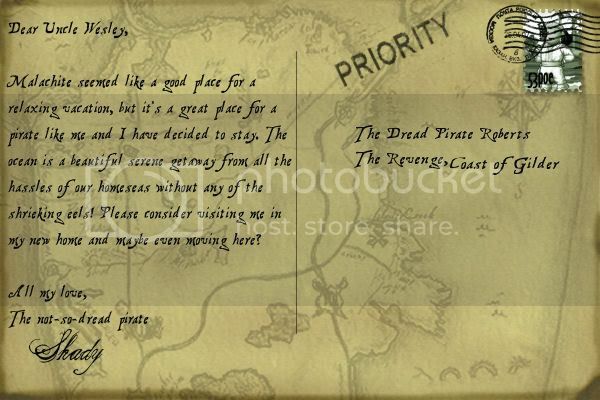 on the back of the postcard. 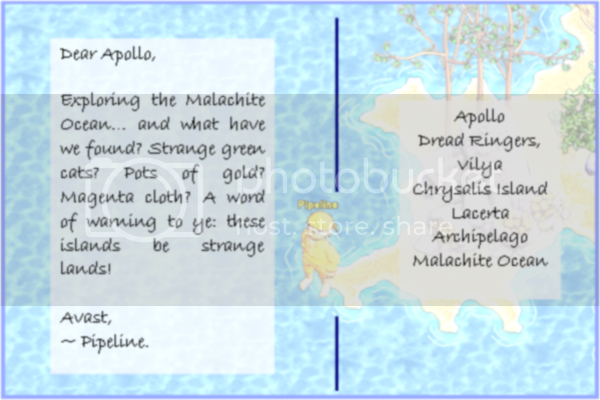 You can have a postcard representing the whole of Malachite Ocean, or an archipelago, or an individual island, part of an island, or if you wish, an individual shoppe, stall, or other building, or a notable person, ship or animal! 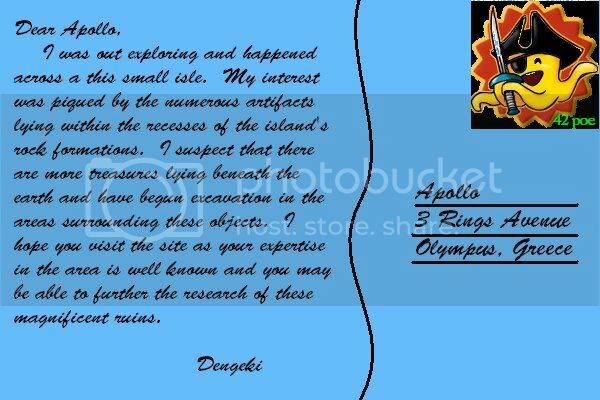 I want all images to be the same size, whether they are posted in the thread or posted as links: each side of the postcard should be 600 pixels wide by 400 pixels high, and if you're posting images in the thread, use .jpg or .png format. Either work on that image size from the start, or create the images at a larger size, then use a resizing tool to get down to 600 x 400. 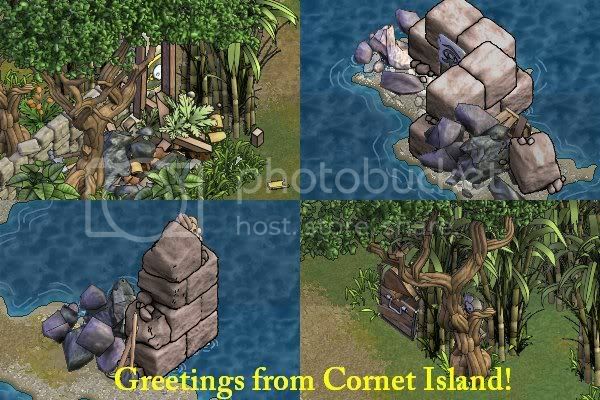 The main images must be unaltered screenshots from game. 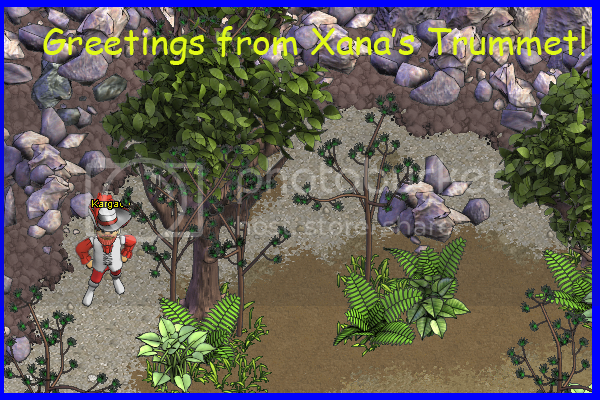 However, you can add a short caption to it, and you can add frames / borders / edge decoration as required. The whole thing, including framing and caption, must be 600 x 400. You can make this any format of writing you wish - a short message, a bit of prose, a verse.... You can address it to someone if you wish. You can add line drawings to the message if you wish. 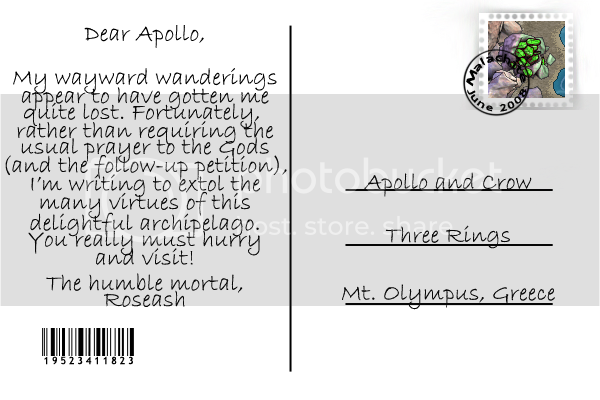 If you want to include a postcard-style layout, including stamp, you can do - but you're not required to. 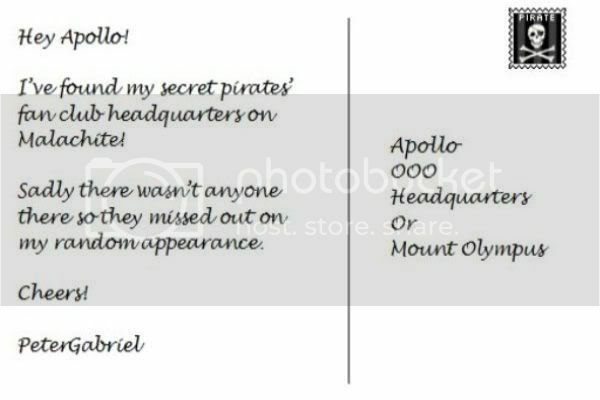 I'm asking for the message to be an image rather than plain text so that you can lay it out how you want to, and so that you can use something closer to a hand-written message if you want to. 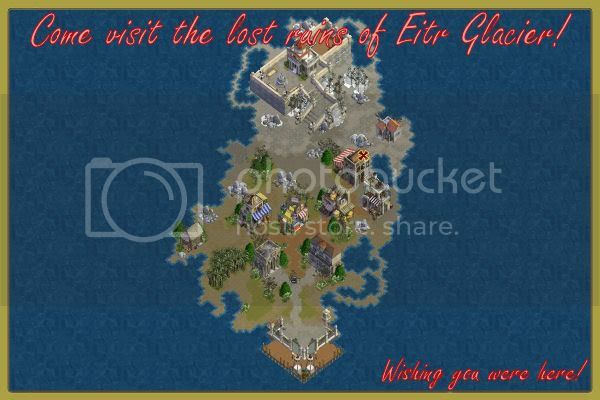 Click here for a page that has helpful hints on creating images, hosting them on a website, and posting them correctly. Remember to click on "Post a reply" rather than "Post new thread" when you provide your entry. Use "Preview" to check that your images are showing before you post your entry. Use the Edit button to make any changes required before the deadline - don't double-post. * Entries should be posted in this thread. * Only one entry per player. 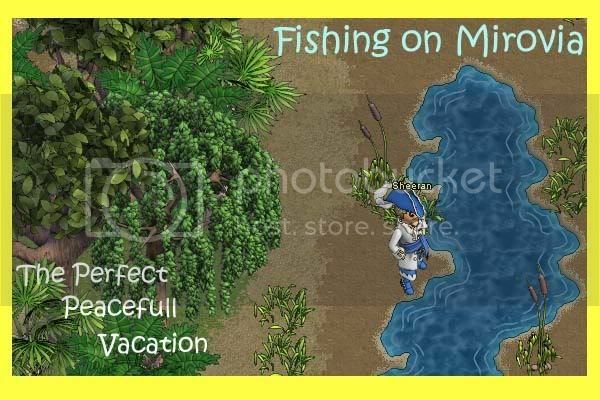 * The image from the game can be framed / cropped etc, but the image itself should be an unaltered screenshot from the game. * If you use a screenshot of an individual, you should make sure you check with them for permission before using them in an entry. If you use a crowd scene in a public place, you don't need permission from everyone! * [optional, and just for whimsy] Your favorite piratey word! This is a 24 hour event. The deadline is exactly 24 hours after the timestamp of this first post. Prizes will be mostly trinkets, and could also include other items if the whim takes me! I will not be giving further details on prizes until winners are announced. 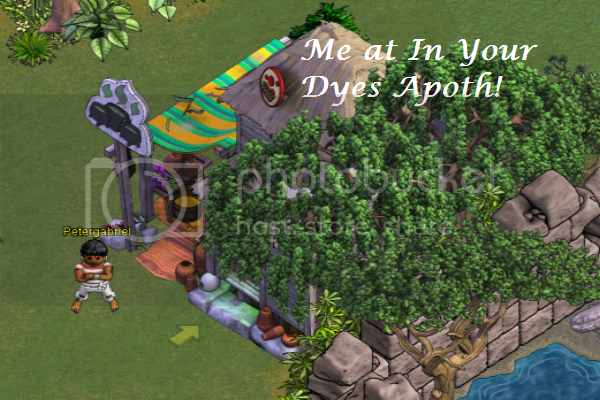 Cocain tells ye, "Would you like some candy?" Ye told Cocain, "yes :3"
Cocain tells ye, "Hop in my car." Saviour tells ye, "Im not going to lie, power gives me wood"
...disagreeing with you always feels pretty indistinguishable from being wrong. This is an actual screenshot, i lagged out and i found myself walking on nothing. edit: changing the image size from 599 x 400 to 600 x 400. XD! Oooooooookay. 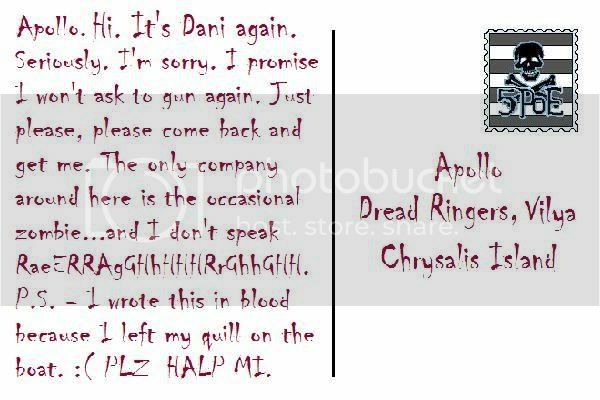 I'm Dani on Malachite. Edit: Eep! Forgot to add favourite pirate-y word! "Barrelstopper." What exactly is meant by "The image from the game can be framed / cropped etc, but the image itself should be an unaltered screenshot from the game."? Could the picture(s) be faded around the edges, or less then 100% opaque? 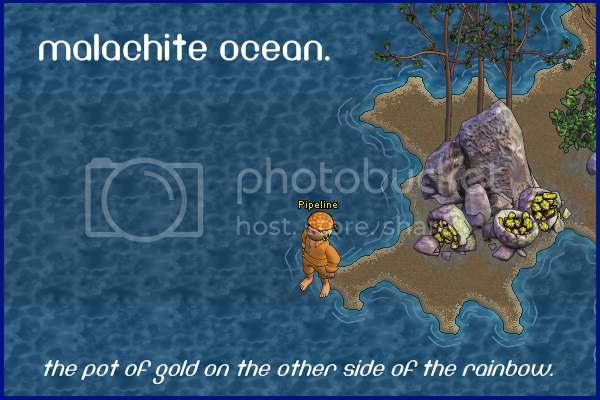 Kargach of the Malachite Ocean, for this event at least. 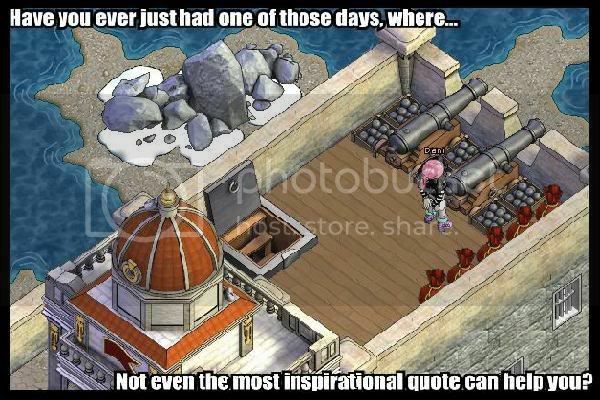 And my favorite piratey word... I hafta go with "mizzenmast". My favorite pirate term is "booched", as in "Ye booched it!" Not really sure what that says about me. 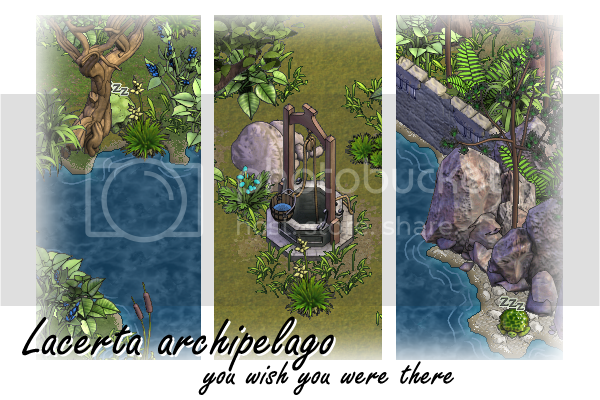 wow, this entries are great!! You can certainly fade around the edge as part of framing. I guess you can make it less than 100% opaque also. The point about it being unaltered is that this isn't a photoshopping contest, so the actual content of the picture(s) should be unaltered. Kofhearts on all my ocean! Yarrr! 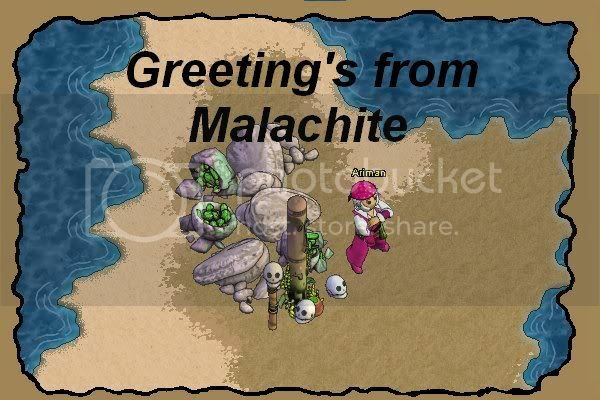 Here be my postcard, sent from Taff of Malachite Ocean to Jonnyblue of Sage Ocean. I would have to say that my favourite Piratey word, at this point in time, is Karkinos. I'm still yet to work out what the plural is, and that intrigues me. I mean, is it Karkini, Karkinae, Karkinoses, or something that I haven't even contemplated yet? Eh. It's late. 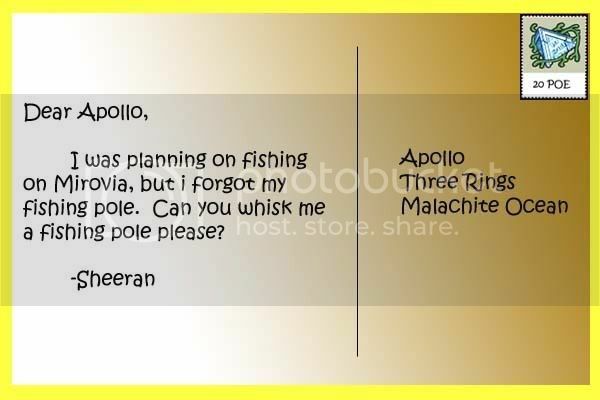 Apollo told me to do it. Misspelling my own name on the card FTW!!! Sorry for any spelling mistakes, my brain is rather fuzzled from being in the middle of school exams. My favorite piratey word has got to be swashbuckler. I am an expert buckler of swashes. my favourite piratey word is definitly "Plunder!" Ye told Populerboy, "how long until your pillage finishes?" Cardshark says, "What in the seven seas?" 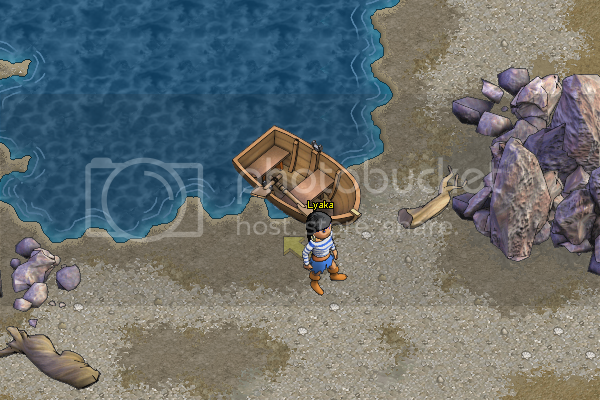 Populerboy says, "OK welcome crabby needlefish wb ship thanks"
Favorite pirate word used in game/in real life: Arrr!